[Jakarta, LTTW] The presence of animals and plants is unquestionably essential for the continuation of life as we know it. Imagine if lions were wiped out from African savannah; it would adversely impact the ecosystem of the continent. Many animals have gone extinct, and many of them are still waiting for their impending doom. A great number of species are currently in the brink of extinction, such as horned guan in Mexico, sea lions, Sumatran tigers, Sumatran orangutans, mountain gorillas, and many more. This extinction is not a natural event; it is the result of human mistakes, negligence, and cruelty. Humans are just too greedy – the only thing that matters to them is making profit without thinking about the consequences. They should realize that profit is not only about money, but there is also humanity aspect to it. Jane Goodall is one of the very few who apply the concept of ‘profit for humanity’ [Sacred Bridge Foundation’s term]. That’s why, Listen to the World thinks that it is important for us to get to know more about Jane Goodall. With the appearance of “Jane” in Hollywood recently – a film documenting her life, is very enlightening. This documentary was directed by Brett Morgan, an American director known for his acclaimed works such as Cobain: Mountain of Heck, Chicago 10, to name a few. Perhaps, before the documentary was released, only NatGeo channel avid viewers and academics that are familiar with her name and reputation. This documentary has shed light on her, making her more popular in public sphere. The documentary was released just in time when animal extinction issue has become the center of attention. Dreams are an important part in children’s growth, echoing Albert Einstein’s famous quote ”imagination is more important than knowledge.” This word of wisdom is corresponding to Goodall’s life, which dream was built on his childhood dream. This dream would materialize within her and lead her to study about animals and environment. Her love for animals has made her an authority on zoology and ethology. At the age 27, Goodall inadvertently began to study the life of apes when she was working as an assistant to Louis Leakey, an anthropologist. At that time, Goodall was studying the so-called ‘human ancestors’. Goodall recalled the time of her early career, when she was still lacking in experience and had to face a lot of criticism. But, thanks to Leakey, who believed in her wholeheartedly, she could continue her research and stayed on track. Goodall grew up in the time of Counter Culture Movement in the US back in the 60s, where gender equality issue began to take center stage. Goodall has shown the world of science that women could take part just like men with her brevity for conducting research in Tanzania. Not only that, Goodall made very strong criticism toward animal exploitation in research, which eventually changed the way scientists treat lab animals. Her passion for animals and nature has forced African people and government to adopt a nature-friendly tourism to save animals from extinction and curb the destruction of their habitat due to humans’ activities. Her thoughts and actions have brought about a new set of ethics in the world of science. Goodall’s field works have shed lights on the life of primates; among others are the social hierarchy in a chimpanzee colony and a ground breaking method of friend-making between human and chimpanzee, known as the “Banana Club.” She also gained a new perspective based on her experience living with chimpanzees that not only are they herbivores, they are also carnivores and sometimes cannibals. Moreover, she discovered that chimps are able to build hunting tools, just like humans. Jane does not only care about nature and animals; she also cares about humans’ life and well-being. In the International Day of Peace, Jane Goodall (who was appointed UN Messenger of Peace) spoke about the impact of Syrian war to humanity, which has created refugees. Refugees are people who are fear for their life and safety. And just like humans, animals are living things, too, equipped with emotions and a sense of fear. It’s been decades since Jane Goodall decided to live with what she believes in, and she is not slowing down despite her age. She keeps on campaigning for peace and ethics for a better world. Sacred Bridge Foundation believes that plants, animals, and humans are part of nature, in which they live in harmony. But humans have done nature a great wrong; how much longer mankind can survive? 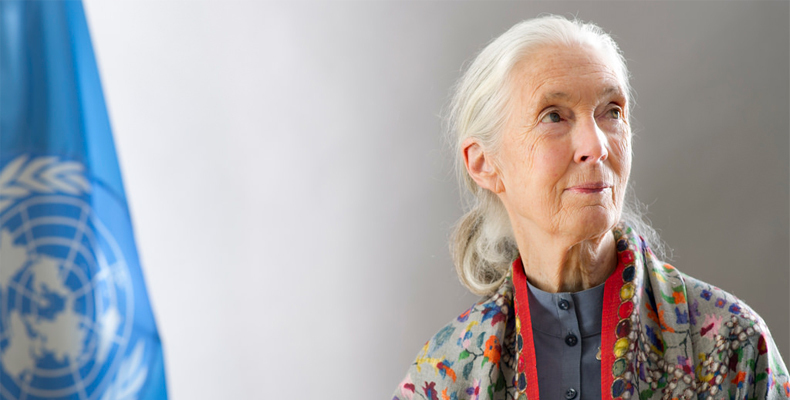 Jane Goodall is another proof that it is the minority that can make a change. Ever since the first time I read an article about her in my reading class at college, I’ve fallen in love with her. She’s such a brave woman with passion and compassion. Aside from her contribution in raising awareness in terms of animals and nature, she also sets a good example about being a strong and determined woman. She should be a role model for young girls. Of course she cares about humanity. She spends her whole life to understand nature.